LT family grows by two. 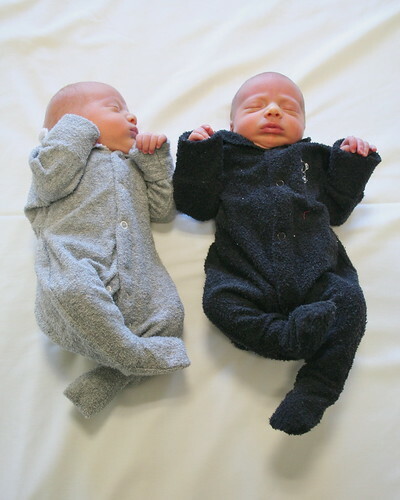 LT's sysadmin, Felius (johndalton) just Tweeted..
"We are delighted and rather surprised to announce the safe arrival of Max (2835g) and William (2925g)!" John! How wonderful!! We want pictures when you come down off Cloud 9. I've heard LT is in for a baby boom. This must be the first boomlets. Oh, joy joy joy! So glad everything came off. Congratulations! How exciting!! Best wishes on the arrival of your new baby boys! Happy happy joy joy! Congratulations. Oh, they're up! John's Flickr page is public, and connected to his profile, so I don't think he'll mind me posting a link to it. 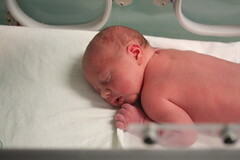 Warning to the squeamish: Surgery shots, but much less than he threatened, "The first Chat-Roulette caesarian." Awww! So cute. I skipped the 'messy' ones! They look to be healthy husky boys, especially for twins. Blondie Will especially looks like he might be a good rugby player. Blondie Will especially looks like he might be a good rugby player. With four young boys in the house, everyone is going to be a rugby player. I think they're more into Aussie Rules down in Tasmania. Gorgeous, gorgeous. Hope everything is going well. Fingers, toes, arms and legs all crossed that LT doesn't have any emergencies over the next few days either! Re sports: One more (or you join in) and you've got enough for a polo team. Yay. Congrats Felius and family. Congratulations, Felius. Hope everything continues to go really well. They're a good weight for twins, too (I should know, I have a pair myself). How sweet! They are handsome fellows aren't they!! Congrats to you and your family and I'm glad that all is well. Congratulations. The babies are just awesomely cute! 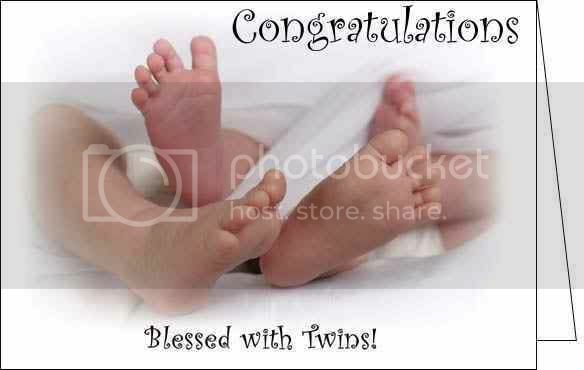 More best wishes on the birth of your beautiful baby boys!! I wish you and your wife much joy in the years ahead with your wonderful soccer or cricket "team". Congrats on the babies. They look wonderful. Update: Hopeful that mum and bubs can come home on the weekend. Here's another piccy.. Thanks. They're adorable. What do the older boys think? I love how they're both doing the same dance step! Thanks for sharing. Congratulations. I like the word "bubs"! Congratulations! Nothing like new babies at home to increase the fun! Congrats to Mom & Dad & brothers, too!! Best wishes to all! May your household always be a busy, happy place! Um, are there enough differences for you to tell them apart when they aren't wearing different colors? Birthmarks or something? I've had twin friends who could fool just about everyone but their own parents. Sort of like the Weasley twins! Bravo, and congratulations to you both! Congrats on two beautiful boys. 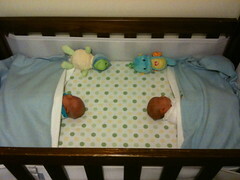 I have two-year old twin boys (fraternal) and let me tell you, there is NEVER a dull moment! So, who was first, and are you going to tell them? 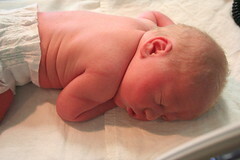 The pictures say that William came out first.... because they thought he would be Willow!! Congrats for mum, dad and the brothers! Very adorable boys! Congratulations! They are adorable. Looking forward to hearing about all the "double trouble" they get into as they grow! Loads of congratulations felius and family! Thanks again everyone for all the best wishes! We were able to bring the babies home on Saturday, and as I type this we're about to enter our fourth night with them at home. Things are going pretty smoothly so far - the first and third nights they slept 3-4 hours uninterrupted between feeds, while the second night had me up roughly once an hour to settle Max. Thankfully he was settling easily enough. >45 clamairy: We're all but certain that they're not identical. We had never anticipated the possibility (given that we were expecting a girl), and they had separate placentas, amniotic sacs, etc - making it a pretty small chance. Besides, if they *are* identical then they're not doing a very good job of it - they have different coloured hair! >34 bnielsen: I'm always surprised by the words that are new to people in other places around the world. Every now and then I'll say something to Tim, or he'll use some phrase, only to find that the other person hasn't ever heard it before. Whatever they do, at least we know they will Love Books! Do be sure to give breaks to the wife from all that testosterone in house. My daughter, mother of 4 boys as well, goes and gets her nails done and other girly things to help. May they figure out this sleep thing, so you can get a reasonable amount of it too. Congrats and best wishes!! The boys are adorable!! Oh my goodness, what adorable boys! Congratulations!